Create a grid that is 35X35 yards. Place a small goal 2-3 yards wide in the center of the grid using either training sticks, flags or tall cones. Surround the goal with a circle of small disc cones. Split the team into groups of 3. If you have a odd number of players you should have them rotate in. Play a 2v1 to the small goal. Two attackers and one devender. Whoever loses possession of the ball to the defender becomes the new defender. 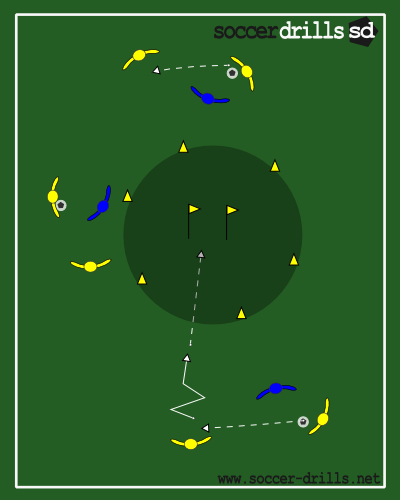 None of the players are allowed to enter into the center circle. Attackers keep possession by playing combinations and supporting the person with the ball. Attackers should be patient and look for an opportunity to attack and not just kick. Attackers should know when to take the defender on and go to goal. Be accurate on attempts on goal as the goal is fairly small.